Salter Path Road that is…to a place where sunsets last just a little longer. As you step out onto the balcony of Atlantis Lodge, this three-story, horseshoe-shaped motel, you’re almost close enough to taste the salt water, where the salt heals wounds and the rhythm of the tides soothes your soul. When you stay with A.C., Dot and Donna at this family-owned motel located at Mile Post 5 in Pine Knoll Shores,you can escape to a place of peace, tranquility, and nature. You can even bring the family pet. Donna’s grandmother and Dot’s mother — Ruth Bray — started Atlantis Lodge in 1963 after the death of her husband. Ruth went on to become the first woman to win the Charles J. Parker Award for excellence in North Carolina tourism and she received numerous hospitality honors from the U.S. Coast Guard and Marine Corps. Ruth found comfort in creating a retreat for others. Today, Donna is the third-generation in her family to look after the property as general manager. She strives to keep that down-home, beach cottage feeling while keeping up with current trends and attention to small details. From freshening the flower beds each season to leaving dog treats for the furry, canine guests, this is the kind of small details you’ll find here. No, you won’t find any high-rise towers to block the view, over-priced room service food or expensive Wi-Fi (pssst, Wi-Fi is free here). Stroll onto the patio and you will find a pair of white rockers, a porch swing, gas grills, and a sun-kissed personal beach attendant to greet you and make sure you have lounge chairs and an umbrella set up before you descend past the dunes and sea grass, and onto the beach. Prefer lounging by the pool, look no further than the shady, live oak leaves hanging over the lagoon-like pool with waterfall which makes a gradual drop into the baby pool. 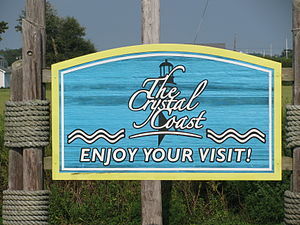 So, if you’re looking for a real gem along the Crystal Coast, look for the turquoise sign. The Atlantis grounds welcome wanderers.